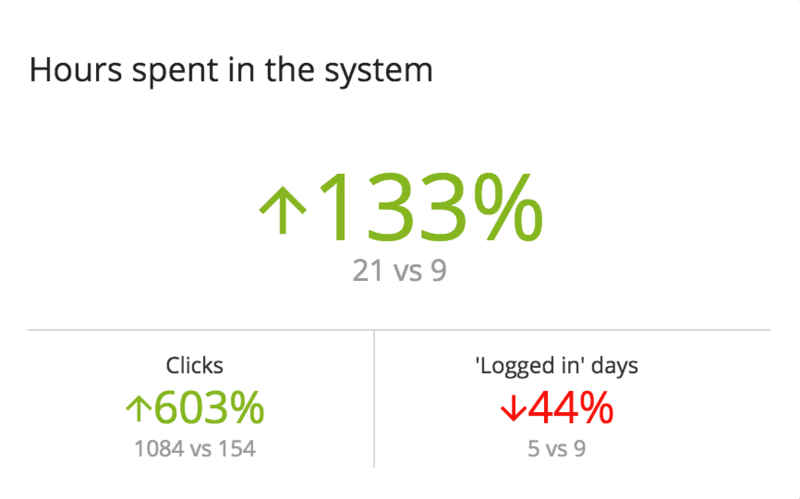 On the Profile view page, you can check the most important information relating to system usage and sales. Here you can compare the performance of a user with previous periods. Examined period: The period set here will be compared to the preceding period of the same length. Compared period: The ‘Examined period’ is compared to the period shown here. This is set automatically and its length is always the same as the ‘Examined period’ and always precedes it. Example: 133% increase refers to the change of the examined and compared period. 21 is the number of hours spent in the system during the examined period. 9 is the number of hours spent in the system during the compared period. Closed tasks: Tasks closed by the user during the examined period (every module is involved). Closing rate: Rate of leads won in the examined period in comparison with all leads. Won: Number of leads won in the examined period. Lost: Number of leads lost in the examined period. Task postponement: How many times a task was postponed by the user. If a task was postponed more than once during a day, the system counts it one. The value is updated every night. Average of overdue tasks: The average of overdue tasks is measured. The value is updated every night. New leads: Those cards are measured that got into the Sales status group and are assigned to the user. Stuck leads: Those leads that are in the sales phase for a long time and should have been already closed. After spending 60 days in the sales phase, leads become stuck. This value can be changed in not manual sales modules. Forgotten leads: Those leads that were not contacted in time. The length of the period can be set in not manual sales modules. Hours spent in the system: How many hours were spent in the system by the user during the examined and the compared periods. Clicks: How many clicks were made by the user during the examined and compared periods. ‘Logged in’ days: Those days are counted when the user was logged into the system.